In the halcyon days of the 1970s in North Dakota, when the state was a quieter, kinder, friendlier, more thoughtful place, the Legislature passed a bill, and the governor signed it, designating the Little Missouri River as our state’s only official State Scenic River and creating a commission to look out for it. The Little Missouri Scenic River Commission did its job through the administrations of four governors who cared about the Bad Lands and its river — Art Link, Allen Olson, George Sinner and Ed Schafer — two Democrats and two Republicans. It met regularly, rerouted proposed pipelines to protect trees, kept gravel miners, oil drillers, seismologists and road builders out of the river valley, made sure oil wells and tank batteries were above the bluff line well away from the river and even passed rules regulating barbed-wire fences across the river. 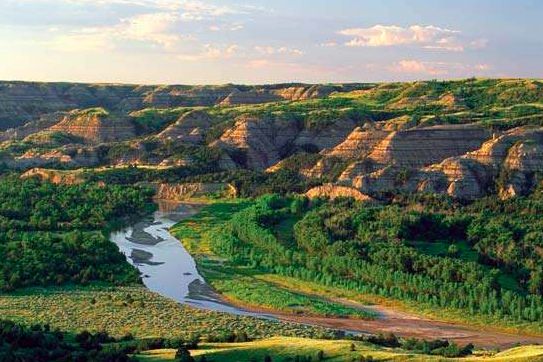 With the election of Doug Burgum, who was an easterner, but owned a Bad Lands ranch, there was some hope that the state’s only Scenic River might once again get some special attention at the highest levels of government. Didn’t happen. Oh, Burgum reformulated the commission, but then he asked it, as its first official act, to ratify a policy making it legal, for the first time in more than 40 years, to use Little Missouri State Scenic River water for industrial purposes — read: fracking. They did that this week. One of the things they did with that authority, to help “maintain the recreation quality” of the river, was to adopt a fencing policy, which said that fences across the river “must have a gated opening of at least 8 feet.” They adopted that policy at a meeting in April 1995. Now, I’ve been canoeing the Little Missouri for more than 40 years, and for the first 35 years, I rarely encountered a fence across the river. Once or twice in all those years. But a few years ago, Lillian and I canoed from the Logging Camp Ranch, south of Medora, into Medora, a trip we’ve done probably half a dozen times. And in that 40 or so river miles, we encountered eight fences across the river, none of which had gates. We were forced to get out and portage around every one of them. On about fence No. 6, I angrily vowed to bring a wire cutter with me the next time I canoed that stretch of the river. I cooled down after a couple of beers in Medora, and instead just decided to never canoe that stretch of the river again. And I haven’t. Which is too bad, since it is the stretch that goes around Bullion Butte, one of the nicest places on the entire river. Entire planet, for that matter. Well, he’s right, of course. In the halcyon days, cattle along that stretch ran free and were rounded up and sorted in the spring for branding. Now, fences keep everyone’s herds separate. I’m writing all this on the heels of this week’s Scenic River Commission meeting in Dickinson, at which the commission was asked to weigh in on three issues. The first was Burgum’s policy of allowing for industrial use of water from the river for fracking. The policy was adopted by the State Water Commission, which Burgum chairs, about a year ago, but the Scenic River Commission mulled it over for a while before finally giving it the okay this week. So instead of looking out for the river, maintaining its “scenic, historic and recreational qualities,” the first official action of the newly formed commission was to give its blessing to the industrialization of the Little Missouri State Scenic River. There are already approved industrial water permits at 10 ranches on the river right now. Who knows how many there will be in a year, or five years. Well, after more discussion, the motion failed on a 5-3 vote, with only Allen, Slope County rancher John Hanson and Parks Director Melissa Baker voting in favor of it. Then there was silence while commission chairman Joe Schettler, Dunn County’s representative on the commission waited for a motion to support the bridge. No motion was forthcoming. So, after a long pause, Schettler recessed the meeting for a bathroom break. So the commission took no position on the bridge. The third was a discussion of the illegal bridge already built over the river in Dunn County by Wylie Bice, which I wrote about the other day. After some discussion, the group decided that since the bridge is already there, not much can be done about it. So they gave it tacit approval. But the discussion turned to the idea that it was actually the Corps of Engineers fault the bridge was there because they signed off on the bridge but hadn’t checked with the Bureau of Land Management, on whose land the bridge is located, to see if it was OK with them. So the group passed a motion to send a letter to the Corps asking them to please share information on things like this. A couple of them take their responsibility to protect the river seriously. More of them are there to protect their county’s economic interests by not letting environmental protection get in the way of the industry that fuels their county’s economy — oil. The chairman himself has an industrial water permit and sells water from the river to the frackers. To be fair, he hasn’t been voting on these things, saying he will only vote to break a tie. State Parks director Melissa Baker is there to protect the river. State Engineer Garland Erbele is there to do what engineers do — build things. He’s no friend of the river. The Health Department is represented by Dave Glatt, head of the state’s Department of Environmental Quality. He’s a lackey for the energy industry, Burgum’s worst appointment to date, who can’t be trusted to stick up for the river. He voted FOR the industrial water permit policy and AGAINST the motion to oppose the new bridge in Billings County, even though it has the potential to be the worst environmental problem ever to face the river if the oil trucks start crossing through the valley by the hundreds, or thousands, as the county has predicted. I told him after Monday’s meeting that, as the state’s top environmental officer, he ought to be ashamed of himself. So what we’ve got, I was moaning to a friend of mine who knows these issues, is what we asked for: an active Little Missouri Scenic River Commission. I guess we have to be more careful about what we ask for. It’s just a rubber stamp for the energy industry, I complained to my friend. And that is bad because their approval of things like industrial water permits and bridges (and who knows what else in the future) gives those who would abuse the Little Missouri State Scenic River the credibility of having been approved and endorsed by an official state government commission. A couple of years ago I began writing about the need to reactivate the commission. I really, really wanted to bring it back and put it to work protecting the river from industrial development. I remember those halcyon days when the Little Missouri Scenic River Commission members really, really cared about the river. And I really, really long for those days again, I told my friend. Did Jim Arthout bring most of the Billings County Sheriff’s Department with him like he did at the bridge hearings in Bismarck and the refinery zoning hearing in Medora? He wants them for when he storms up to the front and takes over the meeting. Governor Burgum has been criticized for excessive use of the state highway patrol when he travels but Arthout uses deputy sheriffs as his personal political backup.